SALT LAKE CITY, Utah – HARMAN’s DigiTech spent the summer touring with the 2012 Vans Warped Tour starting Saturday, June 16th in Salt Lake City, and after hitting all 41 of the tour’s stops across the country, the experience comes to an end Sunday, August 5th in Portland. The Warped Tour is a touring music festival and will feature over 80 bands performing throughout its duration. The DigiTech truck’s stage will round out the tour with a huge line up of acoustic sets from Four Year Strong, I Call Fives, Larry and His Flask, Silver Comet, Matt Toka, Mightly Mongo, Skinny Lister, Chasing Vegas, Cherri Bomb, and Of Mice & Men. “The Vans Warped Tour is a great event for us to connect with musicians across the country. We are proud to support the biggest rising stars in punk, metal, and rock,” stated Rob Urry, vice president, HARMAN Professional Division and general manager of Signal Processing and Amplifier Business Units. DigiTech sponsored band signings and acoustic segments on the DigiTech truck’s stage for bands including Taking Back Sunday, Yellowcard, Four Year Strong, New Found Glory, Pierce The Veil, Dead Sara and Of Mice and Men. 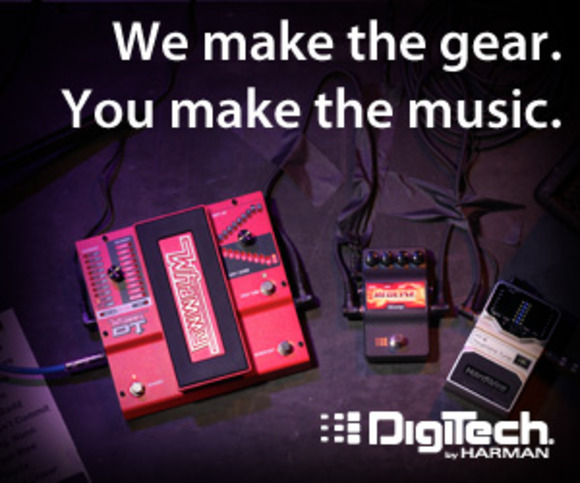 Festival-goers can spend the last few days of the tour trying out DigiTech pedals for themselves at interactive demo stations including the new Whammy, iStomp and iPB-10.